Star Wars Rebels marches towards its final episodes with the Ghost crew recruiting friends and taking a stand in defence of Lothal. The end of this show is so close that it can practically be tasted and there’s a lot to get through in order to wrap things up in a really satisfying way. I’m aware that the finale is currently available but I plan to review each episode without being burdened by future knowledge as always so this is my penultimate Star Wars Rebels review before I watch and cover the two part finale. I’ve mentioned on a few occasions that Lothal has become one of the most iconic Star Wars planets as far as I’m concerned. It’s up there with Tatooine, Hoth or Coruscant though is arguably more developed because it’s more diverse than most planets and a lot of time has been spent building a connection to it. The larger Galaxy spanning conflict between the Rebellion and the Empire is happening elsewhere but this show has always been about a small group of characters so it’s great that one of the final episodes focuses on their efforts to defend the place that they call home. In the main this episode is an extended action sequence but it does a really good job of setting things up before that happens. Ezra and Sabine’s conversation early in the episode does a great job of showing how much those characters have grown and matured over the course of four seasons of television. This season in particular has seen Ezra undergo a lot of growth and the loss of Kanan has forced him to grow up more quickly than he would have liked. Similarly Sabine’s early characterisation was one of the babies of the group with a lot of skill but also a lot to learn but the Sabine we see here is mature, experienced and confident. 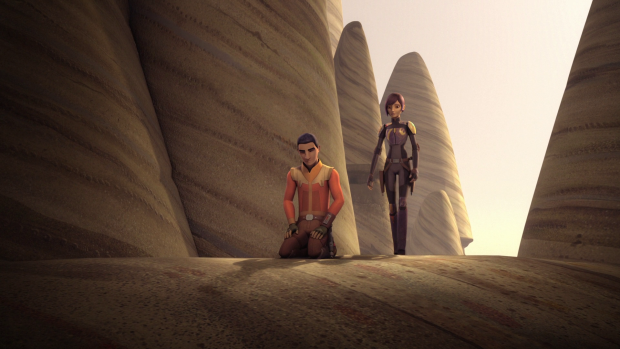 Ezra and Sabine’s conversation shows how comfortable they are with one another and how far they’ve come together. It also reinforces the shift in their roles as they are collectively in charge of the Lothal part of the plan rather than playing second fiddle to Hera and Kanan who would previously be tasked with making the big decisions. 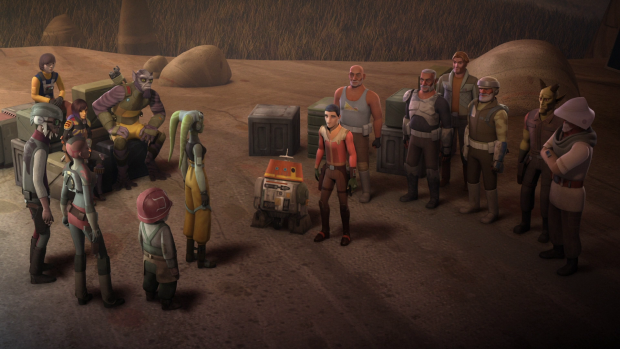 Hera leaves Lothal to pick up some of the supporting characters that the show has made use of along the way. Hondo’s very much a mainstay as is Rex but it’s good to good to see Gregor and Wolff brought in along with Sabine’s old friend Ketsu Onyo. Bringing these characters into the conflict is pure fan service while also being a welcome tribute to the world this show has built over the seasons as well as creating an affectionate nod to The Clone Wars by picking up characters who began life in that show. The fan service doesn’t feel at all empty because these characters have a place within the framework of this show so all have a reason for being there. Naturally defending Lothal involves a far fetched plan with a high chance of failure against insurmountable odds. This involves a triple cross by making Ryder pretend to betray the Rebels in order to lure Governor Pryce to their location so that she can be captured. It’s a risky plan though Ezra and his team have right on their side and are strongly determined to come out victorious. The ensuing action is excellently done with lots of visual variety, impressive tactics and great use of the character’s various skills. Ezra’s command of the Force, a blaster and his lightsaber makes him formidable while Sabine’s jet pack, blaster and bomb combination shows how well honed her skills are. Zeb employs heavy weaponry as he commonly does and the others make good use of what they have as well. Ezra’s fight with Rukh could have been better handled to show Ezra actually besting him but it’s a small nitpick in an otherwise excellent sequence. No matter how skilled they are the difference in numbers ultimately proves to be overwhelming and the Rebels are forced to surrender which reveals to them the betrayal by Ryder who was of course only pretending to hand them over to Pryce. It’s hard to tell whether making it obvious that Ryder wasn’t really betraying the Rebels was intentional or not as there are arguments for both based on how the episode handled it. Either way it wasn’t necessary to play Ryder’s true allegiance as a surprise reveal as it would have been more effective had his loyalty to Ezra remained obvious. The attempt at a red herring really didn’t work. The arrival of Hera and her team in the Ghost kicks off the second phase of the battle and creates even more impressive visual. Using the Ghost to battle the Imperial ships as well as the ground troops was a nice touch along with Hera’s fancy piloting and lots of banter between those on the ship. Ezra summoning the Loth-Wolves made for a predictable but welcome addition to the battle. Their inclusion in the battle was incredibly savage with the audible crack of a Stormtroopers neck being heard at one point. The shift in the Loth-Wolves from mysterious and spiritual to savagely animalistic killing machines is a little jarring but in a good way and makes good use of Ezra’s connection to them. 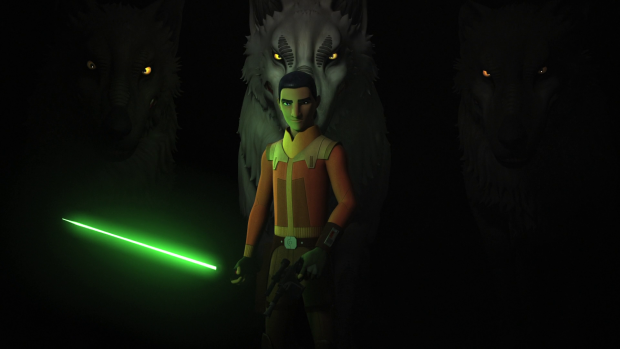 This further reinforces Ezra’s connection to Lothal and the Loth-Wolves willingness to help him suggests that the planet truly accepts him as a protector. There’s depth there if you want to find it but on a simplistic level it’s a bunch of animals killing Stormtroopers which has its own entertainment value. The battle ends with the capture of Pryce who probably gets a better end as a Rebel prisoner than the certain death she was due to endure at the hands of Thrawn. Earlier in the episode she points out that she’s dead if she doesn’t capture the Rebels after her foolhardy actions in “Jedi Night” so her fate has most likely drastically improved. I enjoyed the way she was characterised earlier in the episode. She was portrayed as a leader with very little to lead who is painfully aware of how little time she has left. She comes across as jumpy and terrified so is in a position to be easily fooled by an obvious trap. Winning this battle is nowhere near enough to free Lothal as Ezra points out. He promises to send the Empire running as a statement that Lothal belongs to its people rather than the Empire. It doesn’t look like Rebel reinforcements will be coming anytime soon especially considering this takes place not long before Rogue One so the Rebellion is stretched pretty thin at this point and simply doesn’t have the resources to commit to this. To my mind it’s better to end this show with a tight focus on the core characters defending the place they call home and Ezra’s declaration promises just that. An excellent episode that takes stock of how far the characters have come and how much they have grown over the seasons. Ezra and Sabine’s early conversation clearly shows this and putting them in the roles once occupied by Kanan and Hera is a clear sign of their grown. 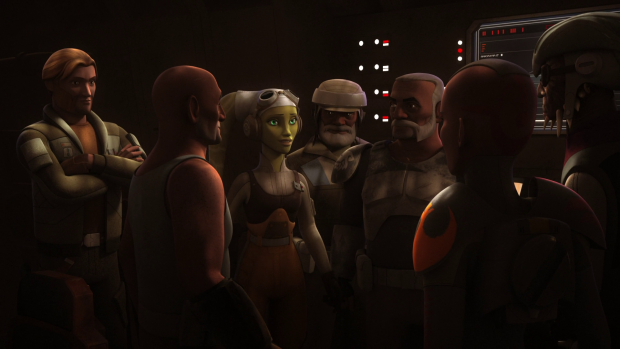 Hera recruiting characters who have been significant both in this show and The Clone Wars makes for meaningful fan service that works in context of the story being told. The extended action sequences are brilliantly handled with excellent showcases for the unique character skills. Ezra’s battle with Rukh could have been a little better but it’s a minor nitpick. The appearance of the Loth-Wolves works really well and shows how savage they can be. Ryder’s triple cross was somewhat unnecessary as it was always obvious what was going on so playing the reveal as a surprise doesn’t really work. The characterisation of Pryce is well handled in this episode with her being afraid of Thrawn killing her as punishment for her mistakes. Her panicked state makes her more susceptible to the obvious trap and her fate is probably better for her than it would have been had Thrawn caught up with her.